LeBron James just won one for the Land. It’s real. The Cavaliers rallied back from down 3–1, galvanized by a dominant James in three straight elimination games. He followed up consecutive 41-point games with a triple double and an ethereal showing in Game 7 against the Warriors in Oakland. The league’s most gifted player put it all together (again) and reminded everyone just how great he is. Six years, six Finals trips, three rings. These Finals were perhaps the greatest showing of James’s historic career. How did we get here? It was far from simple. So, we’re here to jog your memory. LeBron, and the Cavaliers, are champs. Story time! On July 11, 2014, LeBron decided to come home. He announced in an essay on SI.com that he would leave Miami and return to Cleveland, where he spent the first seven years of his career, to try and win a title as a Cavalier. After two titles with the Heat but following a Finals loss to the Spurs, the Akron, Ohio, native headed home. The Cavs had just hired new head coach David Blatt, who James then met for the first time on the set of the movie Trainwreck. 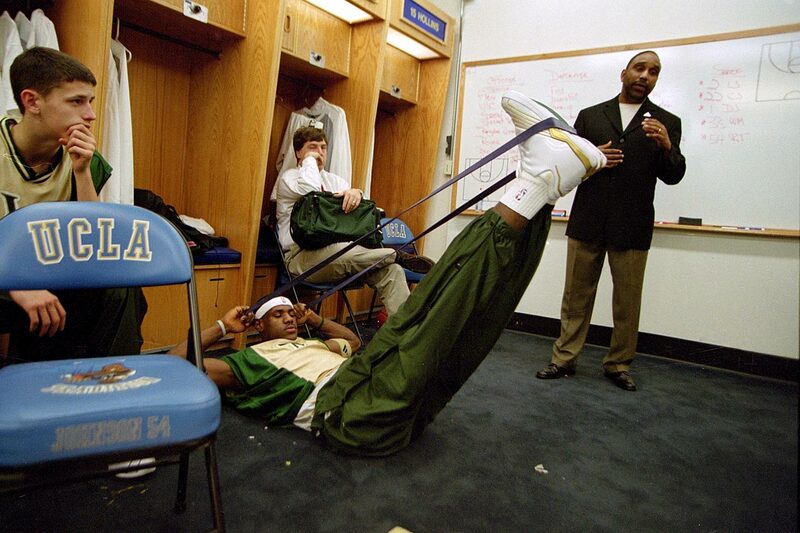 Regardless, it was championship or bust from the start. On August 23, the Cavs dealt No. 1 overall pick Andrew Wiggins to the Timberwolves in a splashy trade that brought back All-Star forward Kevin Love. The trade had been the league’s worst-kept secret, and some suspected LeBron had a hand in it as he prepared for the team to contend immediately. Love was coming off a career year in which he averaged 26.1 points, 12.5 rebounds and 4.4 assists. Cleveland already had budding star Kyrie Irving in place. 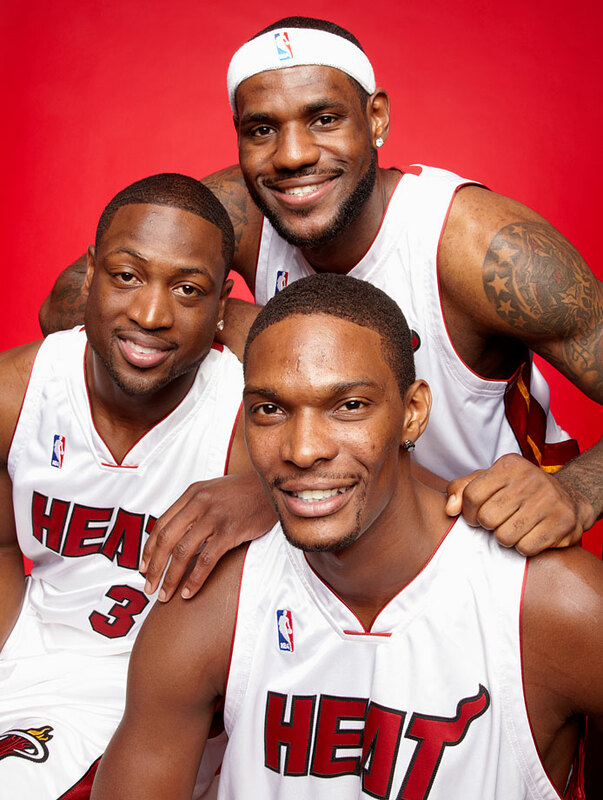 This was the new core LeBron would ride with. Things didn’t go quite as planned from the outset, as the Cavs opened 5–5. Near the midway point of the season, they were just 19–17. It all built to a boil on Jan. 7, 2015, the night of Cleveland’s seventh loss in nine games. James had been resting with mysterious injuries for a week and was away from the team. The Cavs decided to shake things up, dealing former lottery pick Dion Waiters to the Thunder in a three-team deal that brought in mercurial guard J.R. Smith and defensive specialist Iman Shumpert from the Knicks. A day later, the Cavs swung a second trade that brought in center Timofey Mozgov from the Nuggets. With their depth improved and James returning a week later, the Cavaliers ripped off a 12-game winning streak. They cruised into the playoffs, with Blatt winning Coach of the Month for March and the team finishing 53–29, in second place in the East. 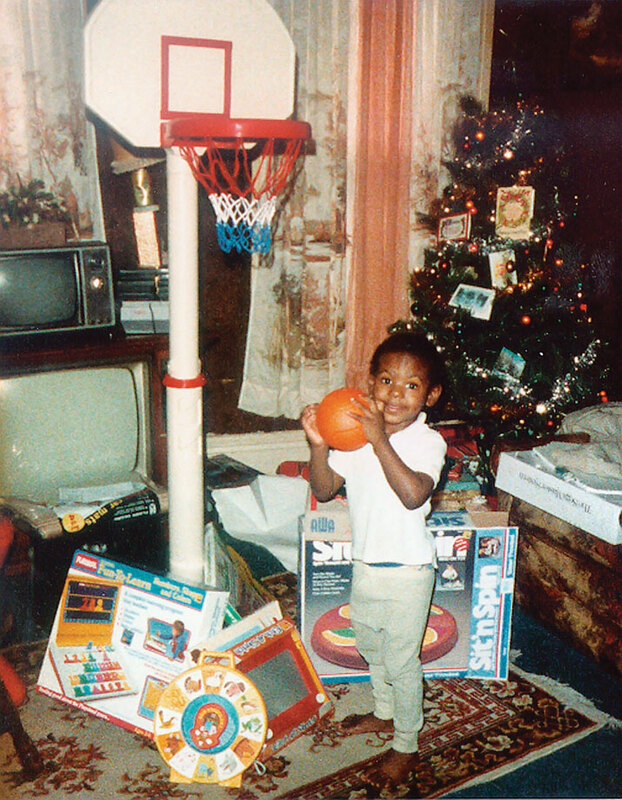 Lebron went with a stuffed elephant over a basketball for this portrait. 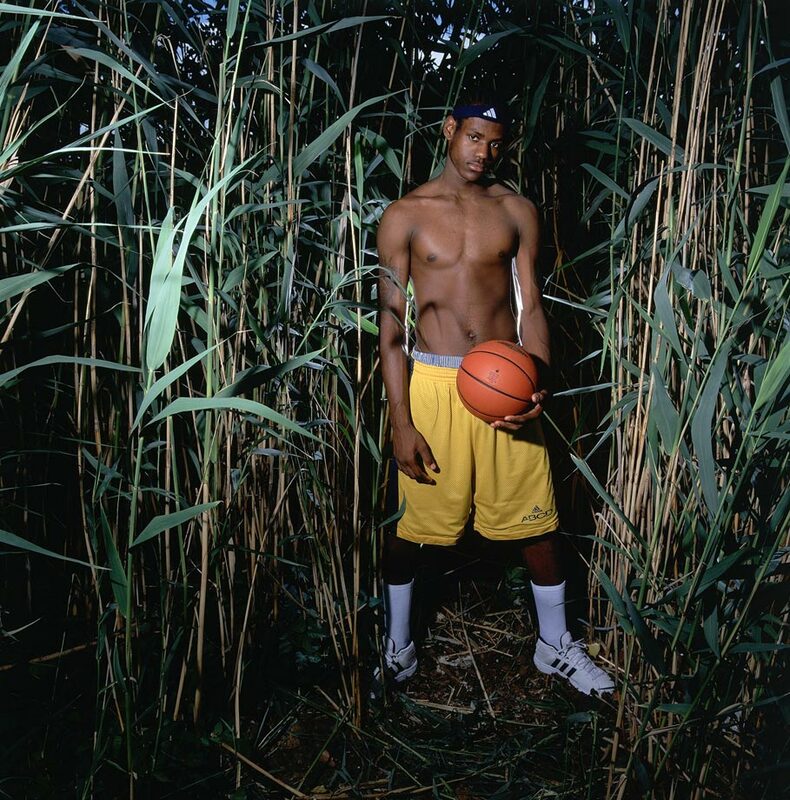 A high-school aged LeBron poses during a Field of Dreams-inspired photo shoot in 2002. James didn't always boast a 250-pound frame, but has always been an intimidating presence, having averaged 21 points per game as a freshman in high school. St. Vincent-St. Mary games were often broadcast on national television and played in college arenas during James' time with the Irish. He never did play in a college game, though. 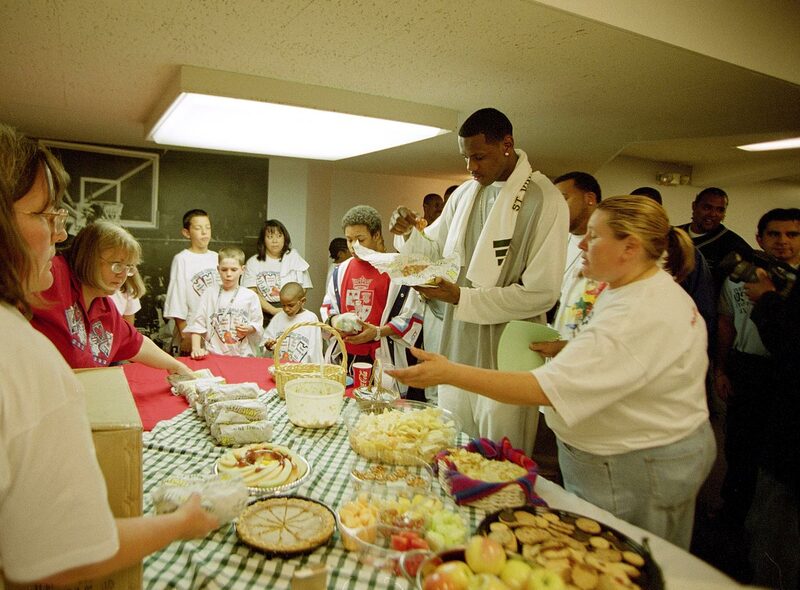 Despite all the fanfare and attention surrounding James in his high school years, the kid destined for stardom stayed hungry. 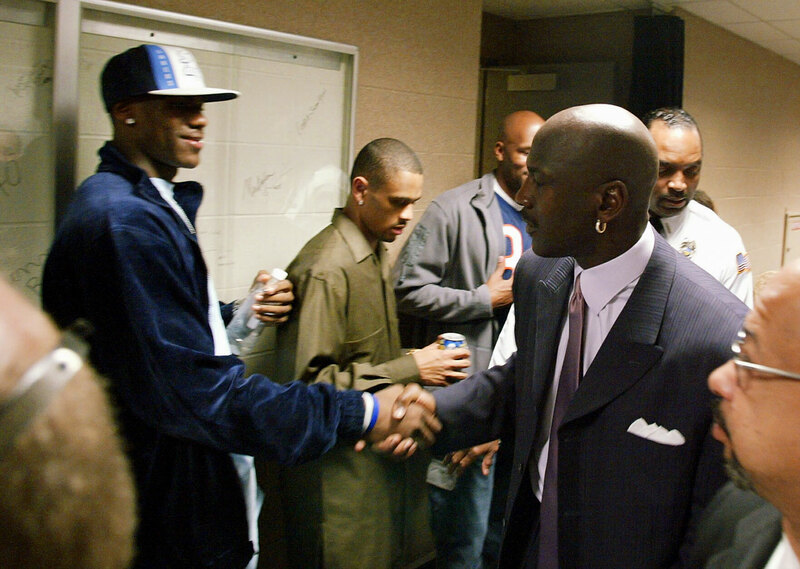 LeBron got to meet Michael Jordan while His Airness was still playing. 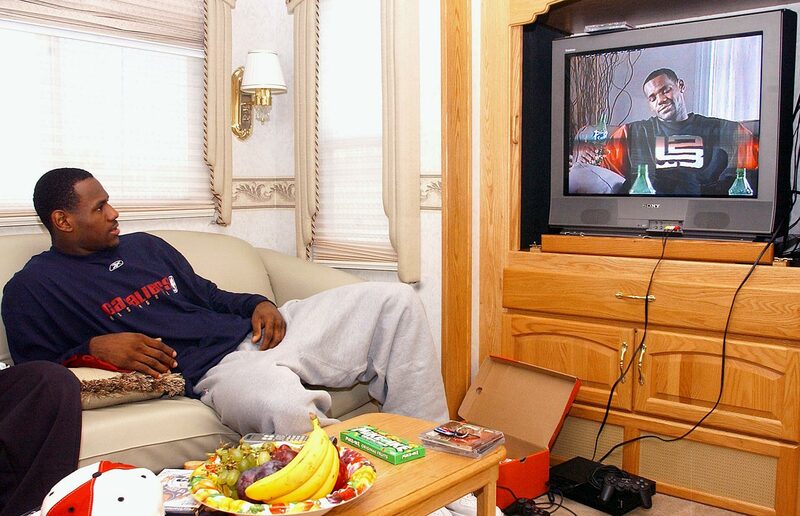 Jordan had just finished playing against the Cavaliers in this 2003 picture. 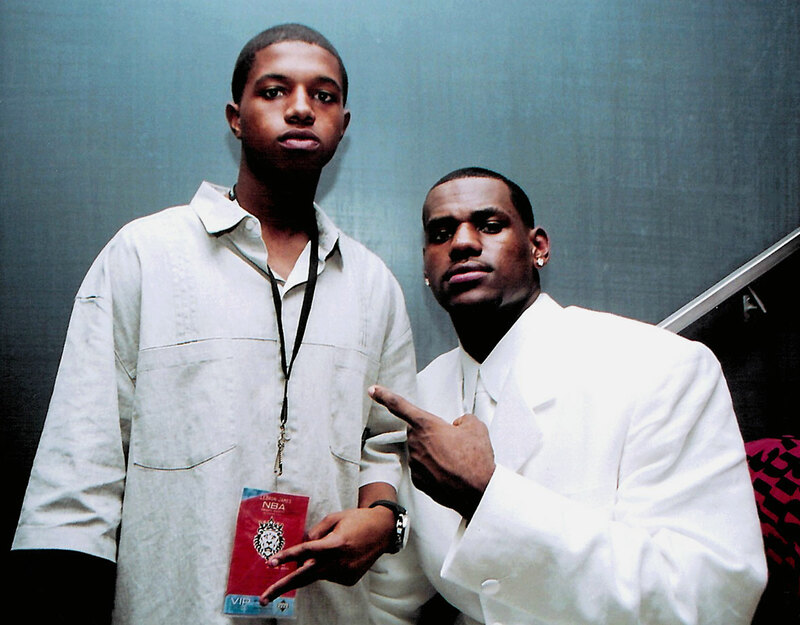 LeBron's younger brother, Frankie, accompanies LeBron at the 2003 NBA draft. Because what else would James watch in his leisure time? Don't we all wish we could be teenage superstars with a limo stocked with Tootsie Pops. 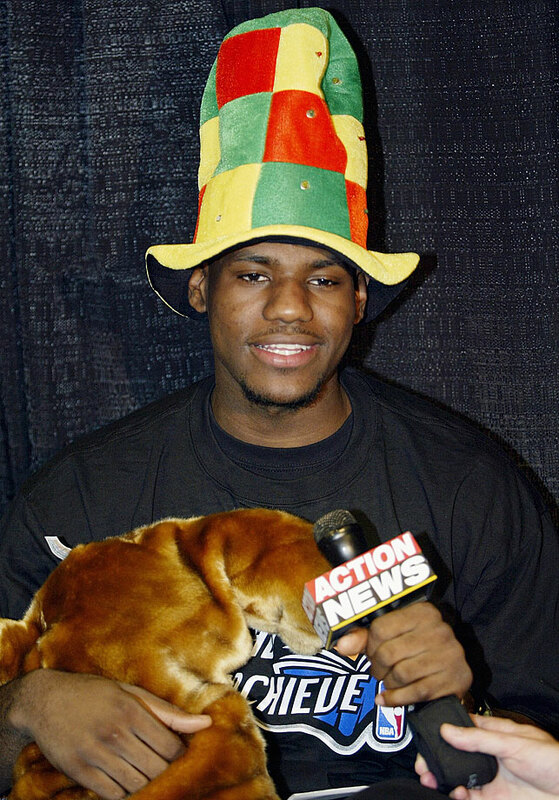 LeBron goes all "Cat in the Hat" while speaking to kids at a Cavaliers Read to Achieve event in 2003. 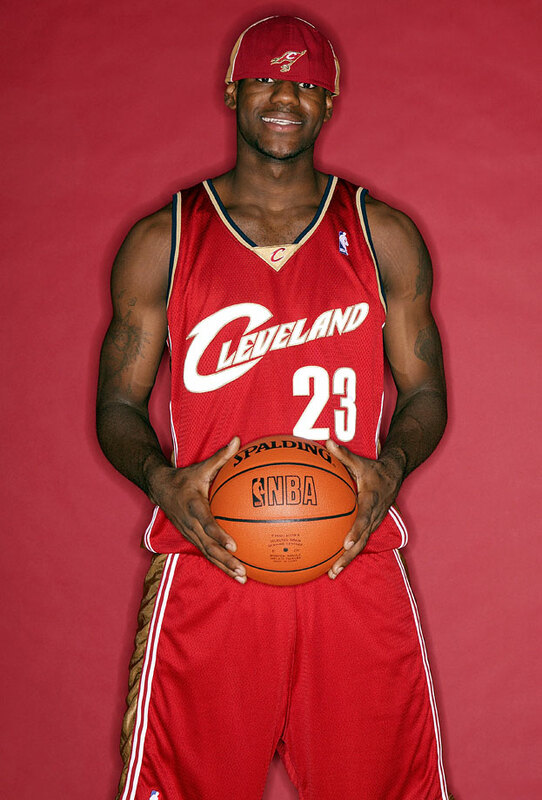 LeBron shows off his pearly whites during an NBA photo shoot in 2003. 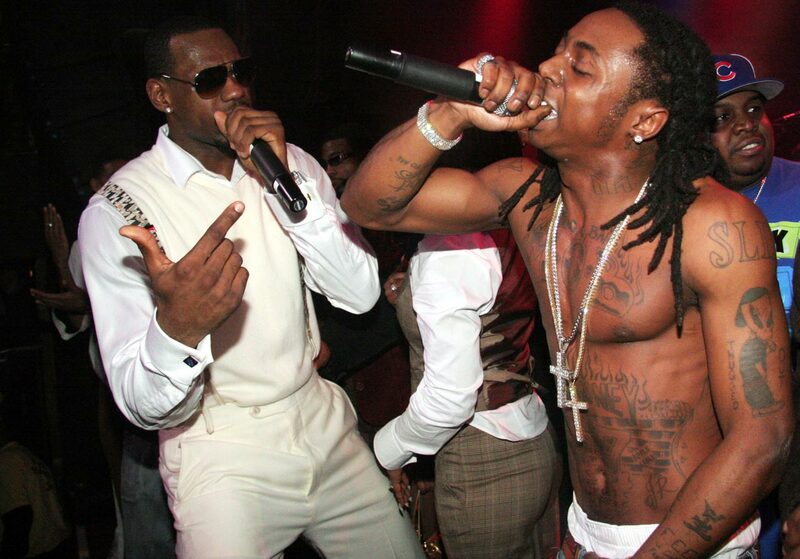 LeBron celebrates his 21st birthday by sharing the mic with rapper Lil' Wayne. James' kid-friendly image has been shaped by his life as a father. 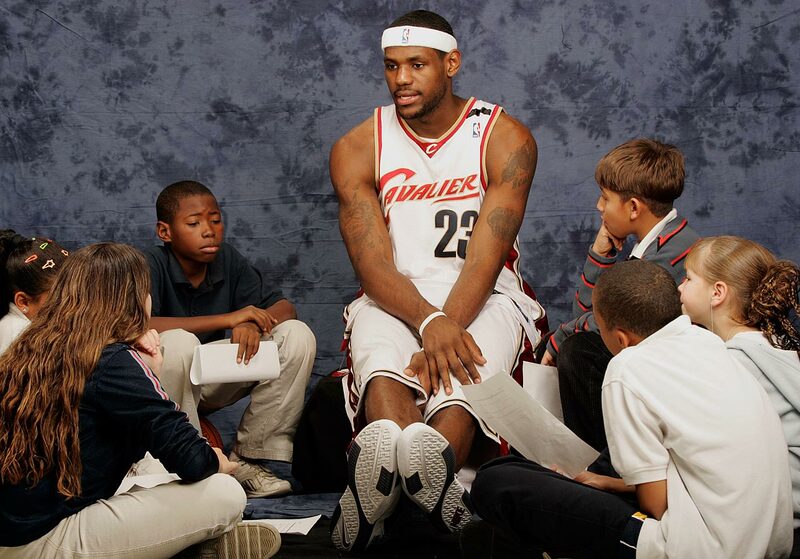 He has three children with his high school sweetheart Savannah Brinson — LeBron Jr., Bryce Maximus, and Zhuri. LeBron James: MVP, All-Star, scoring champ and ... MC Hammer look-alike at the 2007 ESPYs. 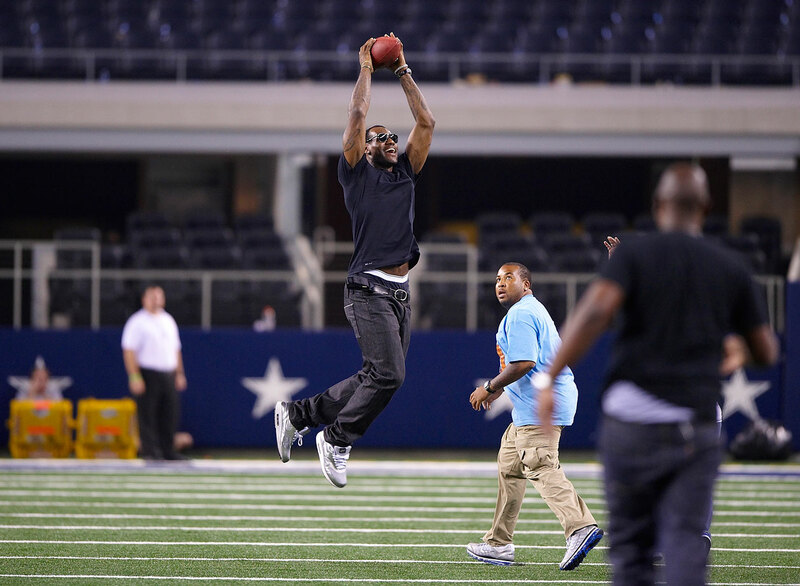 Fans and experts alike wonder how good LeBron could have been as a pro football player, given his size and strength. He was an All-State wide receiver in high school, and even Packers president Mark Murphy has compared his skills to Jerry Rice's. 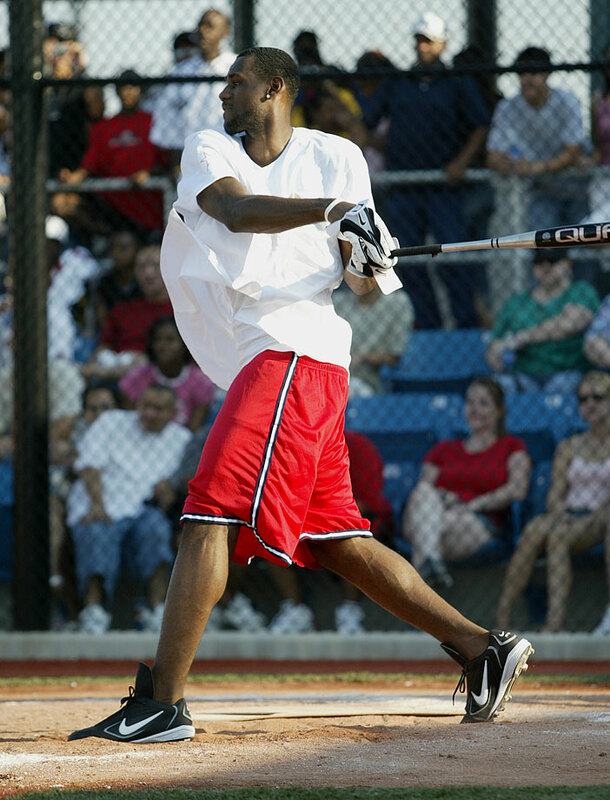 And if he decides to pull a Michael Jordan and try a career in baseball, it looks like LeBron may have a bright future in that, as well. 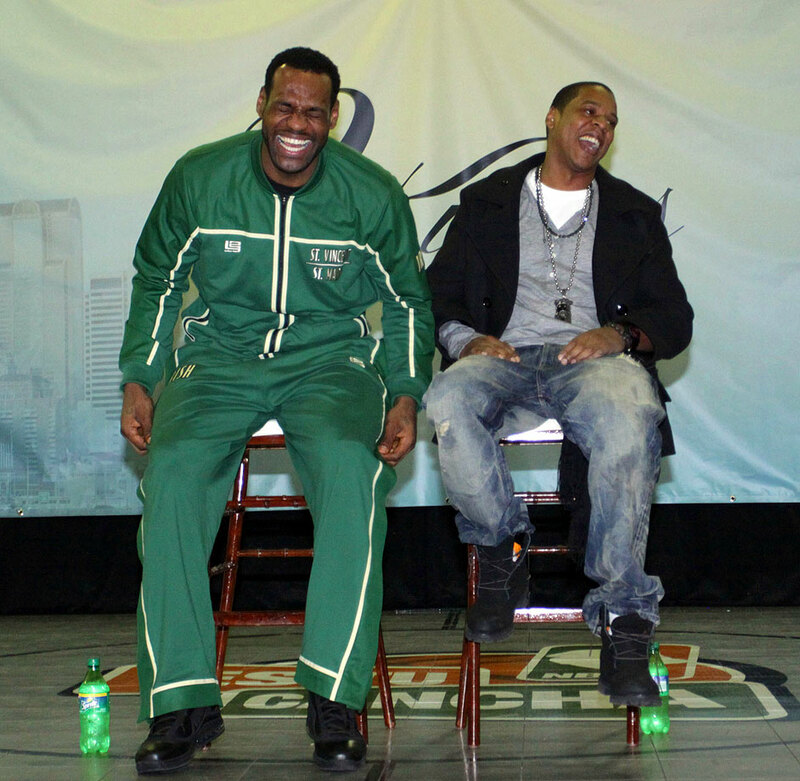 James, decked out in warm-ups of his high school alma mater, enjoys a chuckle with Jay-Z during the 2010 All-Star Weekend in Dallas. 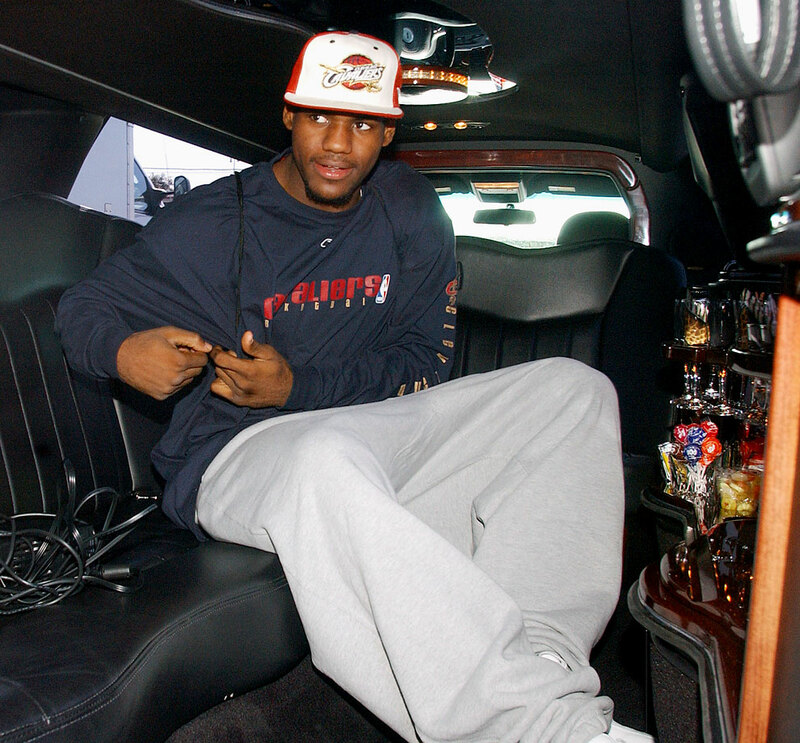 LeBron entered the 2010 offseason as the most sought-after free agent on the market. After contemplating a future in New York, New Jersey, Chicago, Miami or a return to Cleveland, James chose to take his talents to South Beach where he could play with Dwyane Wade and Chris Bosh. Regardless of the ill will, James still makes time for his fans. 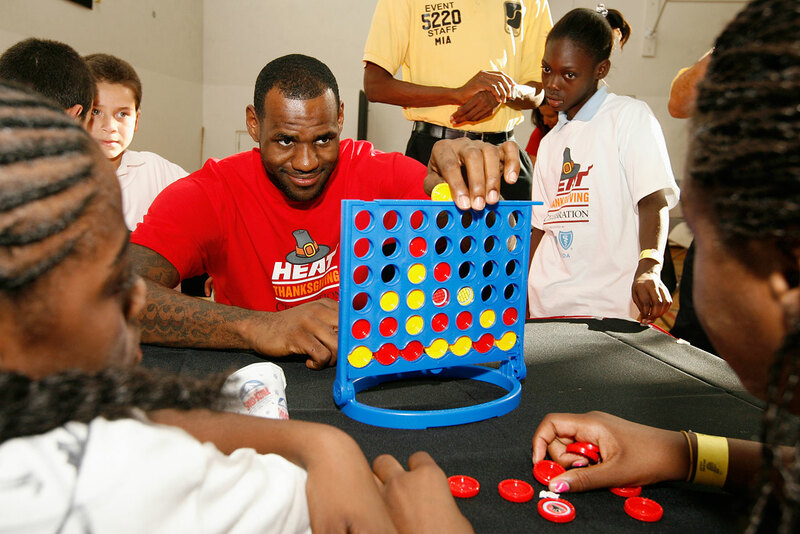 In this photo, The King plays Connect Four with children from the Miami Rescue Mission in 2010. 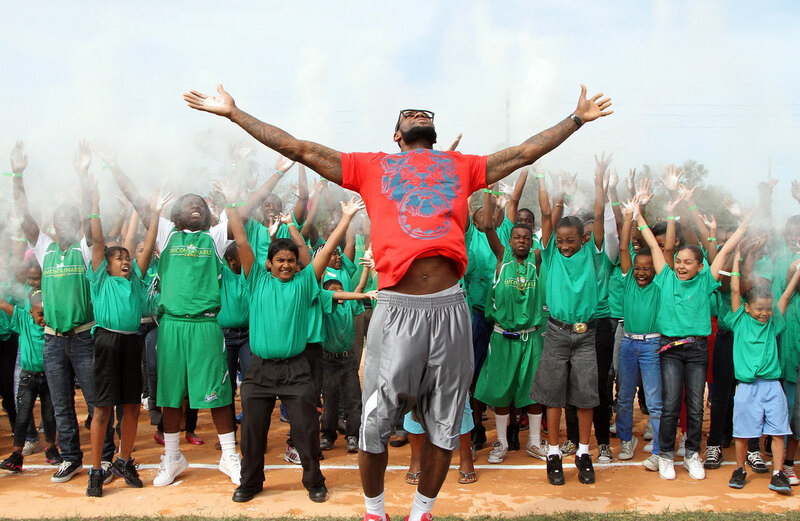 LeBron joins 200 youth in a spontaneous "chalk clap" to dedicate a new athletic field at the Boys & Girls Club of Central Florida in 2010. 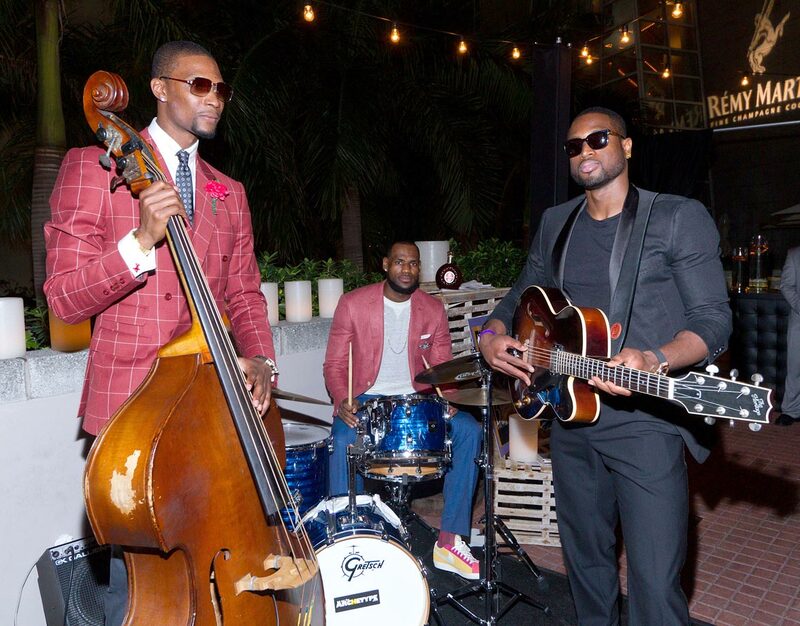 James joins Chris Bosh and Dwyane Wade at a Miami performing arts center to celebrate Bosh's 28th birthday in March 2012. No word on whether this newly formed band performed any songs for the audience. 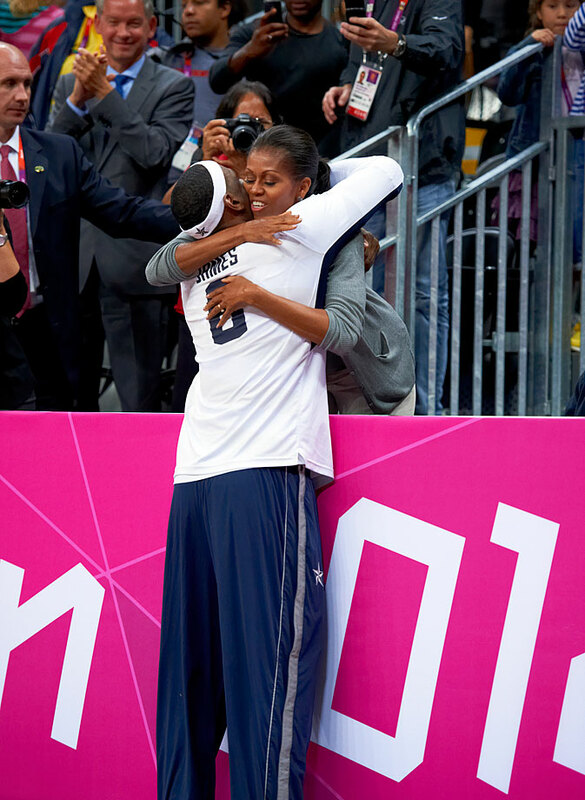 LeBron greets First Lady Michelle Obama at the 2012 London Olympics. 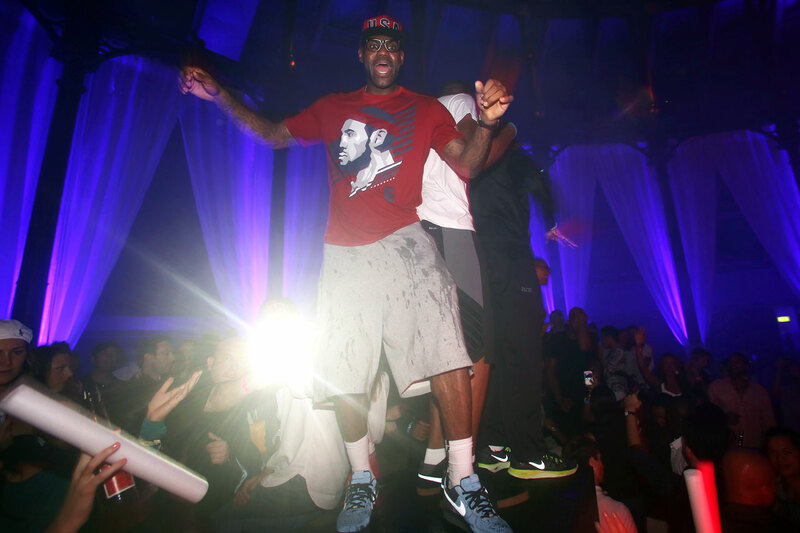 LeBron enjoys some time at a club in London. 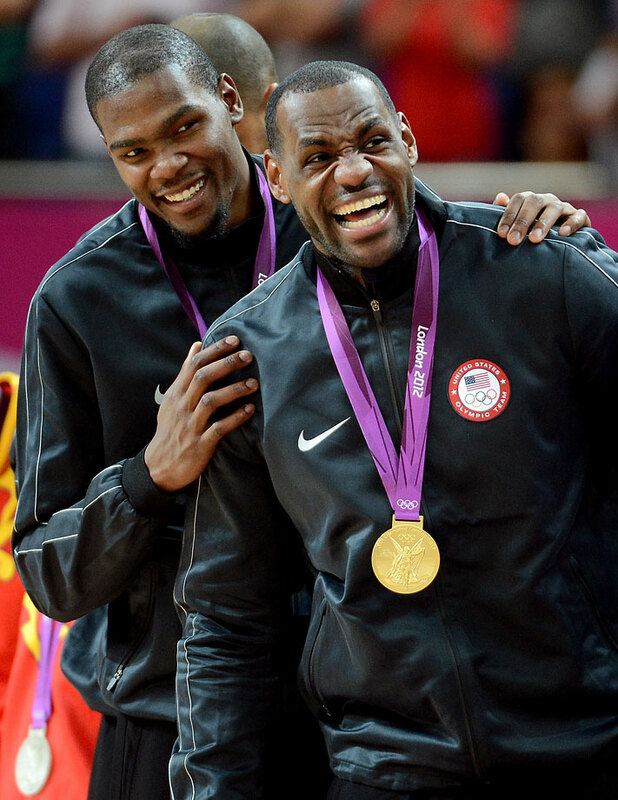 Two months after battling in the NBA Finals, James and Kevin Durant teamed up to win an Olympic gold medal in 2012. 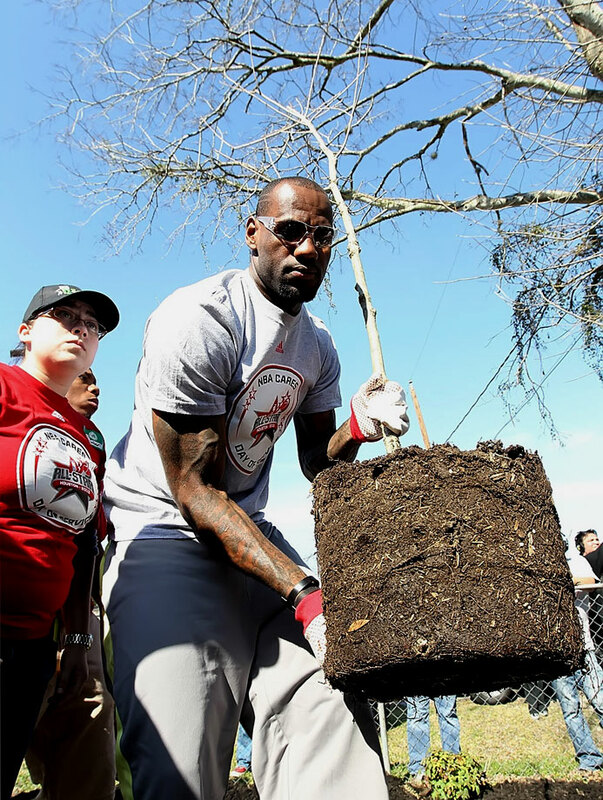 LeBron helps plant a tree during the 2013 NBA Cares Day of Service at the LIVE Project in Houston. 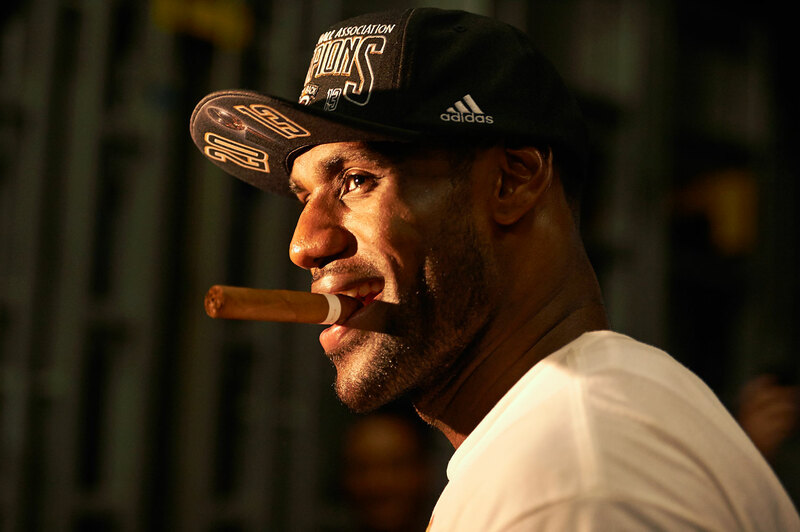 LeBron enjoys a cigar after winning his second consecutive NBA championship and Finals MVP in 2013. 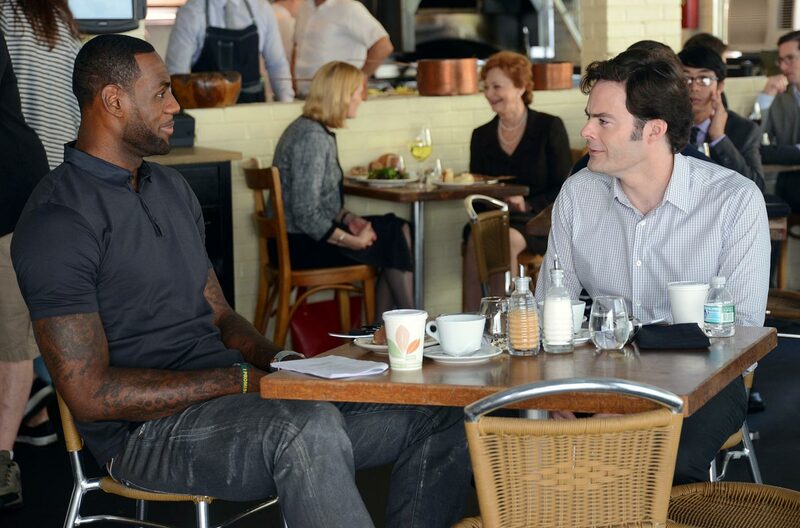 Lebron looks to be filming his role in the 2015 comedy "Trainwreck" with Bill Hader at a restaurant in New York City during the summer of 2014. 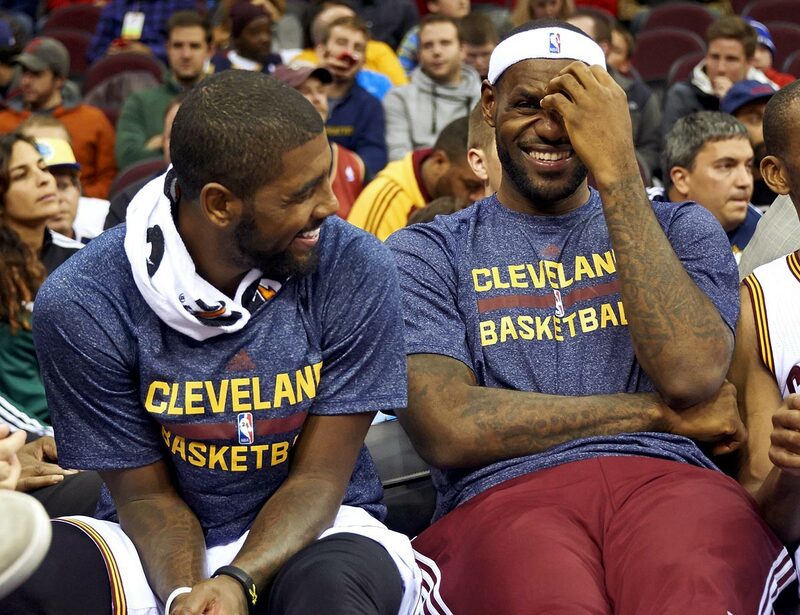 Kyrie Irving and LeBron James share a laugh on the bench during the Cavs 2014 preseason exhibition game with Maccabi Electra Tel Aviv in Cleveland. Lebron James and Kevin Love attend The 2015 ESPYS in Los Angeles. 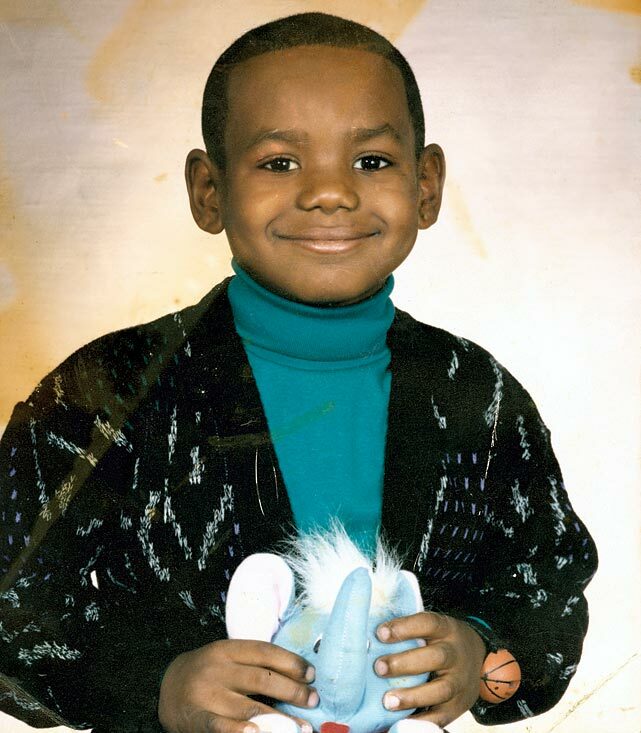 LeBron smiles during a photo shoot in 2015. LeBron holds his 20-month old daughter Zhuri alongside his third NBA Finals MVP trophy following the Cavs' Game 7 victory over the Golden State Warriors in 2016. LeBron poses with some of the nation's top high school players during Nike's 2016 Skills Academy in a private hangar at the one-runway Hawthorne Municipal Airport in Los Angeles. Kevin Love and LeBron James pose with foam fingers during the Cavs' 2016 media day in Independence, Ohio. LeBron celebrates during Game 2 of the 2016 ALCS between the Cleveland Indians and Toronto Blue Jays at Progressive Field in Cleveland. LeBron and the 2016 NBA champion Cavaliers were honored by President Barack Obama on the South Lawn of the White House. LeBron James throws a pass on the field as Cavs teammate J.R. Smith looks on before Ohio State's game against Michigan at the Horseshoe in 2016. Things got complicated for the Cavs in the second round of the playoffs. 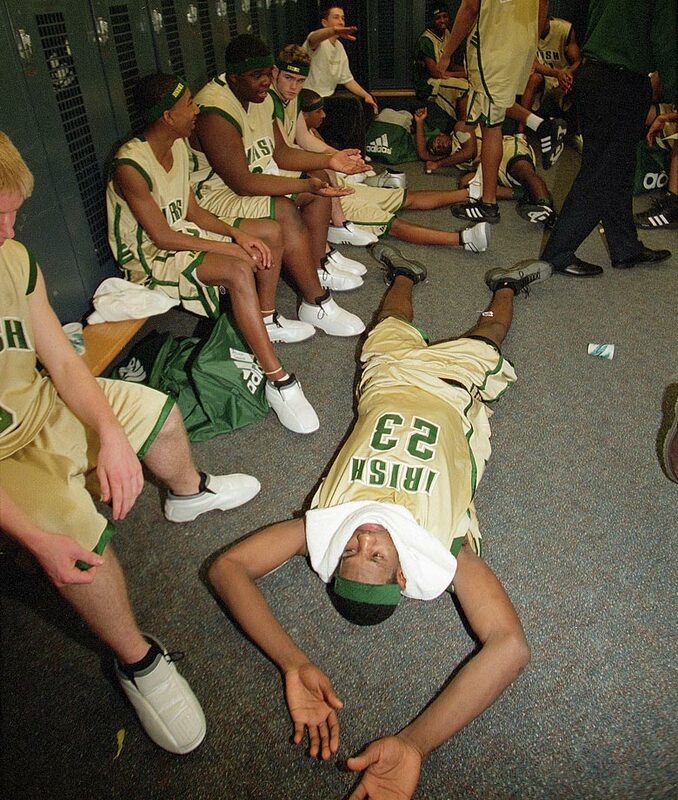 They swept the Celtics in the first round but lost Kevin Love to a shoulder injury that would end his playoffs. Kyrie Irving also battled injuries of his own. The Bulls, whom LeBron had continually tortured in his years with the Heat, posed a challenge, taking a 2–1 lead in Chicago after Derrick Rose’s Game 3 buzzer beater. Two nights later, James answered with a game winner to even the series. The win ignited the Cavs, who won Games 5 and 6 to advance to the East finals. However, the Game 4 victory came with some extra baggage: James revealed to reporters after the game that Blatt’s original play had him inbounding the basketball, and he had effectively called his own shot, disregarding the coach. After the game, replay revealed that seconds before James’s late-game heroics, Blatt attempted to call a timeout the team didn’t have left. Before he could get the referee’s attention, he was pulled back by assistant coach Tyronn Lue. The Cavaliers won the series, but serious questioning of Blatt’s decision-making came with it. After sweeping the Hawks in the East finals, the Cavaliers made it to the Finals, LeBron’s fifth trip in five seasons. The Cavaliers were without Love and Irving (whose injuries had compounded) and ran into a buzzsaw in the Golden State Warriors, whose shift to a smaller lineup and overall depth were too much for Cleveland. The Cavs fell 105–97 in Game 6 to cede the title. They’d leaned heavily on James, their only real creator on offense, and the Warriors countered with unselfish basketball and sublime defense from Andre Iguodala, who would win Finals MVP largely for slowing down LeBron over the course of the series. In Game 5, James was spotted behind his team’s bench, shaking his head at Blatt and forcing him to draw up a new play in the third quarter. Speculation as to Blatt’s job status remained, as did the Cavs’ expectations entering the next season. The Cavs opened the 2015–16 season 8–3, with only minor changes to the roster and a healthy Irving and Love. Reports regarding some perpetual distrust between James and Blatt appeared less noteworthy as James offered a vote of confidence on Nov. 19. "He does his job as great as any coach can do in this league," James said of Blatt prior to the team’s ninth win of the year. "It's pretty easy to team up with a guy like that and it's also, it's refreshing to come every day and to know that you're about the same things with your best guy," Blatt told reporters of James that week. "Bron is that. He's a leader, he's a great player and he wants to win. You can't ask for more than that from any player, particularly your star player." This was probably where things seemed to peak. Blatt won coach of the month and the Cavs largely cruised. But the title-or-bust expectations weren’t going anywhere. The Cavaliers were 28–10 despite some inconsistency heading into their second rematch with the Warriors since the Finals on Jan. 18. The Warriors beat the Cavs on Christmas Day and did so more handily on the second go-around. That’s where things started to fall apart, as the Warriors dominated all facets of the game and blew out their foes on national television. It was a cruel kind of litmus test that suggested Cleveland might be further away from contending than its record suggested. The Warriors were historically good, and the Cavs weren’t there yet. It was perhaps Blatt’s final straw, with players somewhat distraught and the Cavaliers’ mojo blowing in the wind. The head coach was fired days later, with the Cavs 30–11 and in first place in the East. According to reports, James, oft-rumored to have a hand in Cleveland’s dealings, was not consulted on the decision to fire Blatt. General manager David Griffin held a long press conference discussing championship aspirations, stability, and a disconnect he’d perceived at times in his locker room. Blatt issued a statement, and he was out. Assistant coach Tyronn Lue was in. The Cavs won 11 of their first 14 games under Lue before struggling a bit to close February, still in first place. In March, things got strange for James in particular. Do not take his greatness or anyone for granted! There were also weird Instagram posts, and people decided to care that James unfollowed the Cavs on Twitter. He said he’d love to play with BFFs Dwyane Wade, Chris Paul and Carmelo Anthony. He apologized to Tyronn Lue for being odd. The Cavs went 11–5 in March, James averaging 25.6 points, 8.2 rebounds and 7.1 assists all the while. Long story short, the Cavaliers torched their way through the Eastern Conference, blowing through the Pistons and Hawks and getting tested but not pushed by the Raptors. They met the Warriors, who had just rallied from down 3–1 against the Thunder and were riding a historic wave, after a record 73–win regular season. The trio of Steph Curry, Klay Thompson and Draymond Green looked ready to claim a second straight title, especially after taking a 3–1 lead. The stakes were high, the odds were long. This incident changed them, for better or worse. The scuffle between James and Draymond Green led to Green’s suspension after he registered an after-the-fact flagrant foul point. With Green, the fire at the heart of Golden State’s defense and at times the cog that turns the offense out for Game 5, Kyrie Irving and LeBron James ran wild, scoring 41 points each in a huge road win. In Game 6, the Cavs rallied again, this time at home. James scored 41 points once again to go with 11 assists, eight rebounds, three blocks and four steals — and just one turnover. Cleveland won comfortably. Game 7 was everything the rest of the Finals hadn’t been, as the teams traded leads, neither quite pulling away, and the game deadlocked at 89 in its final minutes. This unbelievable block by James kept the score at 89. Kyrie Irving drained what would be the go-ahead bucket. ​James averaged 29.7 points, 11.3 rebounds, 8.9 assists, 2.6 steals and 2.3 blocks in the seven-game series. Six straight Finals trips, three titles in those six tries, and most importantly — to James, you’d have to believe — one for Cleveland.